The Really Really Free Market (RRFM) movement first began in 2003 in North America and has since spread across the world. As a movement that aims to counteract Consumerism, the RRFM forms temporary markets based on the gift economy. 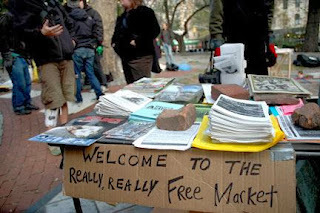 This means at the market, everything is free. The idea revolves around less of the sale of something, but rather sharing items among the community. The Singapore version of the RRFM is supported by the Post-Museum, an independent community of very pleasant people, and takes place about once every other month. These temporary markets in Singapore "pop-up" at various different places and updates are available via their Facebook page. The next session will take place on 15th December at Hong Lim Park and more details can be found here. Do register for a booth if you're interested to contribute and share! So, what will one expect at an RRFM session in Singapore? Well, lifehacksg popped over a couple of times over the course of 2013 and generally we have very positive comments about the concept. Juxtaposed in the setting of Singapore which most argue as a city which symbolizes consumerism, the Singapore RRFM is boldy refreshing! People come from all walks of life to share both skills (teaching Japanese, free back massages, guitar lessons, Yoga sessions, meditation...) and items (books, clothes, food, art pieces ...). At a recent session, we walked away with a self-portrait, poetry and a postcard and some great books! We don't suggest that you go with a mindset of wanting to get free stuff; but rather treat it as a day out to explore yet another unique underground social community in Singapore with the chance of some hidden finds! Remember, bring what you can and take what you need! We Offer Private, Commercial and Personal Loans with very Minimal annual Interest Rates as Low as 2% within a 1 year to 40 years repayment duration period to any part of the world. We give out loans within the range of $3,000 to $90,000,000 USD. Our loans are well insured for maximum security is our priority. Are you losing sleep at nights worrying how to get a Legit Loan Lender? Are you biting your fingernails to the quick? Instead of beating yourself up, call the Exxon Mobil Finance Loan now, Loan specialists who help stop Bad Credit History, to discover a win-win solution which is Our Mission. We specialize in providing capital for business startup, business developments, business expansion and investment capital Ranges from (20,000.00 to 10,Million Maximum C.PL-Euro,Usd,Pounds.) Our funding sources specialize in creative solutions to meet your needs, Project funding, franchise capital and working Capital loan-ILM. Fast Process and Instant Approval/ When Bank say no We say yes! Do you need an urgent loan? We offer loans with a low interest rate. Flora lenders is a legal organization that was created to help People who need help, such as financial aid. she is a USA based financial company. Get approved for a business or personal loans today and get funds within same week of application. These personal loans can be approved regardless of your credit and there are lots of happy customers to back up this claim. But you won’t only get the personal loan you need; you will get the cheapest one. This is our promise: We guarantee the lowest rate for all loans with free collateral benefits. No social security Number required and no credit check required, 100% Guaranteed. So visit Premier Lending Company Website https://tinyurl.com/ybbac5ly or Email: info.premierlending@financier.com to get a loan. interested in loan. I am here to put smiles in all sad faces. We offer Legitimately Bank Guarantee (BG) and Standby Letter of Credit (SBLC) alongside a number of other Bank Instruments specifically for Lease with option of sale optionally available from a certified financial group. We deliver cautiously of the time line required for the completion of transactions and other intermediaries are welcome to deal. Other financial instruments such as , CD, DLC, are also available. Kindly contact me for serious inquiries via email. Do you need a loan for a personal purpose or for your business needs? Here is good news for you. You're in the right place. We have the capacity to provide business and personal loans / loans to companies and individuals at an interest rate of 3%. Do you need long or short term first class financial offer of different categories such as business, personal, home, auto, student, debt consolidation finance e.t.c. no matter your credit score. We are guaranteed in giving out financial services to our numerous clients all over world. With our flexible lending packages, funds can be processed and transferred to the borrower within the shortest time possible, We are certified, trustworthy, reliable, efficient, fast and dynamic. E-mail: trivagofinancialhome.in@gmail.com call/WhatsApp us +1(316)925-6026 website https://trivagofinance.wixsite.com/home for easy application. We offer all types of financing. Our mission is to solve your finance problem and help your business succeed. Are you tired of seeking financial assistance from Bank and different financial organization, Have you encountered firms with unsatisfied financial services? It was unbelievable i got a loan of $200,000 dollar..My Name is Michelle Pambid, i am a citizen of Singapore. I am happy i got a loan from a loan lender which help me out with my loan, i have tried different service but i could never get a loan from those service, some of them will ask me to fill lots of document and at the end of the day it will not end well. but i am happy after meeting with Trivago Financial Loan Company Inc, i was able to get my loan of $200,000 dollar. Now my business is going well and i want to let all of you know this today because they are quick and 100% reliable. now i am paying back the loan i got from Trivago Loan Company Inc. Contact them and don't waste your time with those loan lender at there. Email:trivagofinancialhome.in@gmail.com call/WhatsApp us +1(316)925-6026 website https://trivagofinance.wixsite.com/home Good-luck.